With Cadac’s 9.75-inch pizza stone, enjoy cooking pizzas on your grill or oven without the mess. This durable stone will cook your pizza evenly and prevents char marks that are typically left behind from a grill top. The porous nature of the stone also helps absorb moisture and results in a perfectly crisp crust. Since the pizza stone distributes heat evenly, you will never have to worry about rotating your food. In addition to pizzas, you can also use it to cook quesadillas, crispy cookies, and pastries. 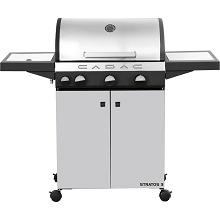 Cadac introduces the 39,000 BTU Stratos 3 Steel Range Grill, a stylish and high-performance unit loaded with features and ample cooking space. This model operates off of three high grade stainless burners as well as an aluminum die-cast side burner, both triggered by automatic piezo ignitions. The main cooking area covers 390 sq. 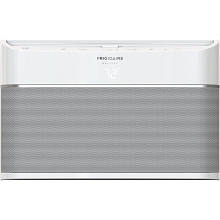 inches and includes formed porcelain enamel cooking grids that fit into place. The 11 in. side burner is built-into one of the collapsible wings on the side of the grill. This model’s dome lid is double-lined with stainless steel for better heat retention and a high-quality thermometer is built-in for your convenience. The grill rests on a convenient stainless cart that provides plenty of storage solutions for your accessories, tools, and gas cylinder. Four heavy-duty caster wheels are located on its base with brake levers for easy moving. 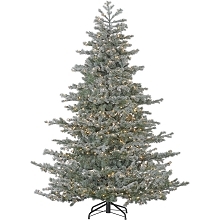 This model has been sealed with a highly durable powder coat finish that protects it from rust and weathering. Cadac introduces the Tailgater Chef, a portable yet high-performance unit loaded with features and ample cooking space. 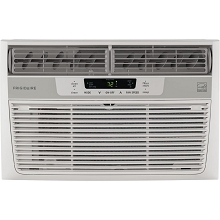 With 19,430 BTUs of power, this model operates off of two high grade stainless burners triggered by push and turn electronic ignitions. The cooking area covers 305 square inches and includes two thermogrids that fit into place side-by-side. These unique, enameled-steel grids provide even heat distribution and a quicker heat-up time. The heat will not go around the grid, but is ‘trapped’ in the U-profile which results in lower gas consumption.The double-layered, porcelain enamel hood retains heat so food cooks faster, and a high-quality thermometer is built in for your convenience. Easy to carry and store, you can also attach it to your RV or Motor Home with our optional RV Bracket - sold separately. Cadac introduces the Stratos 2 gas range grill, a stylish and high-performance unit loaded with features and ample cooking space. With 30,000 BTUs of power, this model operates off of two high grade stainless burners as well as an aluminum die-cast side burner, all triggered by automatic piezo ignitions. The main cooking area covers 306 square inches and includes two porcelain enamel cooking grids that fit into place. The 11-inch side burner is built-into one of the collapsible wings on the side of the grill. This model’s dome lid is double-lined with stainless steel for better heat retention and a high-quality thermometer is built-in for your convenience. The grill rests on a convenient powder-coated steel cart that provides plenty of storage solutions for your accessories and gas cylinder. Four heavy-duty caster wheels are located on its base with brake levers for easy repositioning. 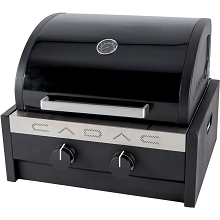 The 98700-23-01/6544-100-KIT includes the Cadac Stratos 2 gas range grill and pizzas stone. The Stratos 2 gas range grill is a stylish and high-performance unit loaded with features and ample cooking space. With 30,000 BTUs of power, this model operates off of two high grade stainless burners as well as an aluminum die-cast side burner, all triggered by automatic piezo ignitions. The main cooking area covers 306 square inches and includes two porcelain enamel cooking grids that fit into place. The 11-inch side burner is built-into one of the collapsible wings on the side of the grill. This model’s dome lid is double-lined with stainless steel for better heat retention and a high-quality thermometer is built-in for your convenience. The grill rests on a convenient powder-coated steel cart that provides plenty of storage solutions for your accessories and gas cylinder. Four heavy-duty caster wheels are located on its base with brake levers for easy repositioning. 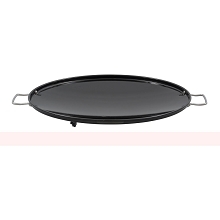 With Cadac’s 9.75-inch pizza stone, enjoy cooking pizzas on your grill or oven without the mess. This durable stone will cook your pizza evenly and prevents char marks that are typically left behind from a grill top. The porous nature of the stone also helps absorb moisture and results in a perfectly crisp crust. Since the pizza stone distributes heat evenly, you will never have to worry about rotating your food. In addition to pizzas, you can also use it to cook quesadillas, crispy cookies, and pastries. 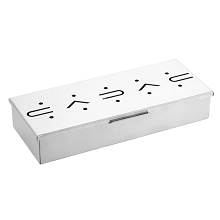 Add a smoky flavor to your food with this stainless steel smoker box. Compact and ready to go, enjoy the flavorful bark that forms on your favorite proteins. 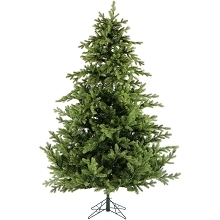 It’s made of thick gauge stainless steel that is durable and easy to clean. 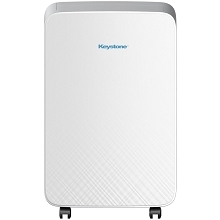 Small enough to travel with, this smoker is perfect for the chef on the go. The Citi Chef 40 is perfect for urban settings where patio space is limited. 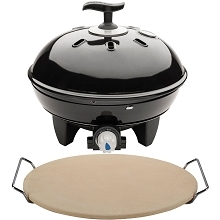 With its compact, tabletop design, nothing will keep you from grilling your favorite foods. With the push of a button, the grill ignites quickly and easily. The durable stainless steel burner produces 8,500 BTUs and the infinite control burner valve allows you to set it to the precise temperature you need with an easy-to-use knob. The heavy-duty enamel cooking surface traps and conducts heat for optimum performance. The 180 sq. in. grid is reversible, with a ribbed surface on one side and a smooth flat surface on the other. A pot stand is included so you can boil water or prepare one-pot meals while you’re outdoors. A convenient travel bag is included so you can take this grill with you wherever you go. 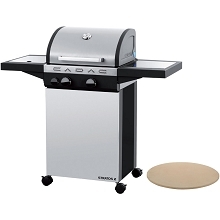 The 5600-20-US/98368-US-KIT includes the Cadac Citi Chef 40 tabletop grill and a pizza stone. The Citi Chef 40 is perfect for urban settings where patio space is limited. With its compact, tabletop design, nothing will keep you from grilling your favorite foods. With the push of a button, the grill ignites quickly and easily. The durable stainless steel burner produces 8,500 BTUs and the infinite control burner valve allows you to set it to the precise temperature you need with an easy-to-use knob. The heavy-duty enamel cooking surface traps and conducts heat for optimum performance. With Cadac’s 13-inch pizza stone, enjoy cooking pizzas on your grill or oven without the mess. This durable stone will cook your pizza evenly and prevents char marks that are typically left behind from a grill top. The porous nature of the stone also helps absorb moisture and results in a perfectly crisp crust. Since the pizza stone distributes heat evenly, you will never have to worry about rotating your food. In addition to pizzas, you can also use it to cook quesadillas, crispy cookies, and pastries. With Cadac’s 13-inch pizza stone, enjoy cooking pizzas on your grill or oven without the mess. This durable stone will cook your pizza evenly and prevents char marks that are typically left behind from a grill top. The porous nature of the stone also helps absorb moisture and results in a perfectly crisp crust. Since the pizza stone distributes heat evenly, you will never have to worry about rotating your food. In addition to pizzas, you can also use it to cook quesadillas, crispy cookies, and pastries. 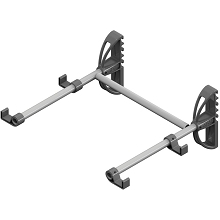 Use the Cadac RV bracket to quickly and easily mount your Carri Chef 2 (sold separately) onto your RV's mounting rail. 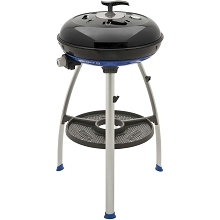 This sturdy bracket has adjustable height settings for easy barbecuing and a convenient dome rest for clipping the dome lid onto the back of the grill. Ideal for RV or Motor Home entertaining, this bracket can be used as a permanent fixture or easily removed and stored in a cupboard. Cadac's 1cm thick (0.4 inches) baking stone can withstand temperatures up to 500ºC (932ºF) and can be used in electrical ovens, charcoal kettles and gas BBQs (but NOT in gas ovens). Use it to bake pita bread, a traditional pizza, focaccia and more. 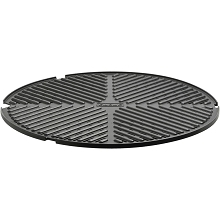 Measuring 18.9"L by 10.4"W, it fits the standard grids of the Meridian and Titan grills. Expand your grilling options with the Cadac baking stone. The Cadac 8910-40 Carri Chef 2 portable grill is ready and able to cook all your favorite items on top of its 257 sq. in. surface. This 3-in-1 portable grill includes a chef pan, a die-cast non-stick BBQ grill plate, a nickel-plated pot stand, and a recipe book. The Carri Chef 2 features a dome lid with an integrated thermometer and a condiment tray. It operates off of low pressure-gas (not included) and has an automatic piezo ignition for easy lighting. A travel bag for the grill and cooktops are included. With the Carri Chef 2, enjoy endless cooking options no matter where you go. The Cadac 8910-40 Carri Chef 2 portable grill is ready and able to cook all your favorite items on top of its 257 sq. in. surface. This 3-in-1 portable grill includes a chef pan, a die-cast non-stick BBQ grill plate, a nickel-plated pot stand, and a recipe book. Use the Cadac RV bracket to quickly and easily mount your Carri Chef 2 onto your RV's mounting rail. The Carri Chef 2 features a dome lid with an integrated thermometer, and a condiment tray. It operates off of low pressure gas (not included) and has an automatic piezo ignition for easy lighting. A travel bag for the grill and cooktops are included. With the Carri Chef 2, enjoy endless cooking options no matter where you go. The 8910-40/98368-US-KIT includes the Cadac Carri Chef 2 Portable Grill & Pizza Stone. The Cadac 8910-40 Carri Chef 2 portable grill is ready and able to cook all your favorite items on top of its 257 sq. in. surface. This 3-in-1 portable grill includes a chef pan, a die cast non-stick BBQ grill plate, a nickel-plated pot stand, and a recipe book. The Carri Chef 2 features a dome lid with an integrated thermometer, and a condiment tray. It operates off of low pressure gas (not included) and has an automatic piezo ignition for easy lighting. 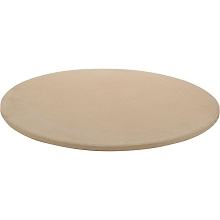 With Cadac’s 13" pizza stone, enjoy cooking pizzas on your grill or oven without the mess. This durable stone will cook your pizza evenly and prevents char marks that are typically left behind from a grill top. The porous nature of the stone also helps absorb moisture and results in a perfectly crisp crust. A travel bag for the grill and cooktops are included. With the Carri Chef 2, enjoy endless cooking options no matter where you go. Grill all your favorite meals with the Cadac 17.5 In. Skottel Top Plate. This grill accessory is an interchangeable cooking surface with stay-cool handles and fits the Cadac Carri Chef 2 and Citi Chef grills. The smooth Skottel surface is protected with a porcelain enamel-coating that is ideal for wok-style cooking like stir-frying, searing, and preparing eggs. A convenient travel bag is included, making this the perfect accessory for the chef on the go. Cadac introduces the Tailgater Chef, a portable yet high-performance unit loaded with features and ample cooking space. With 19,430 BTUs of power, this model operates off of two high grade stainless burners triggered by push and turn electronic ignitions. The cooking area covers 305 square inches and includes two thermogrids that fit into place side-by-side. These unique, enameled-steel grids provide even heat distribution and a quicker heat-up time. The heat will not go around the grid, but is ‘trapped’ in the U-profile which results in lower gas consumption.The double-layered, porcelain enamel hood retains heat so food cooks faster, and a high-quality thermometer is built in for your convenience. Easy to carry and store, use the Cadac RV bracket to quickly and easily mount your Tailgater Chef onto your RV's mounting rail. Use the Cadac RV bracket to quickly and easily mount your Tailgater Chef (sold separately) onto your RV's mounting rail. 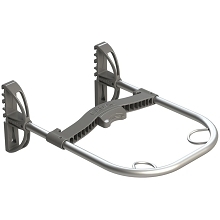 This sturdy bracket has adjustable height settings for easy barbecuing. Ideal for RV or Motor Home entertaining, this bracket can be used as a permanent fixture or easily removed and stored in a cupboard. 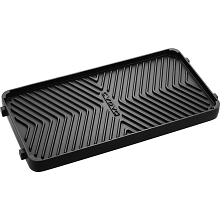 The Cadac 98700-50 is a durable warmer pan for your Stratos Range Grill. Made of hard aluminum and protected with an anodized coating, this is a great accessory to have when grilling small vegetables, delicate fish fillets, and transferring food from the grill top to your kitchen table. Two stainless steel handles ensure stability during the transfer and it is dishwasher safe so clean-up is a breeze. Add this warming pan to your grill collection and enjoy the convenience of cooking outdoors. 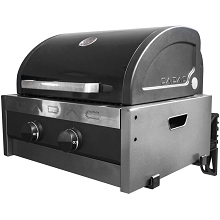 The Cadac 8910-101 BBQ top is a non-stick interchangeable cooking surface that can be used as an additional cooking option on the Carri Chef 2 and Citi Chef 48 range of gas grills. 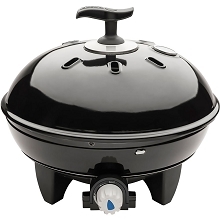 This BBQ top is ideal for grilling various meats while also being easy to clean. 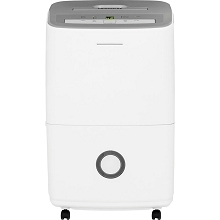 This item comes with its own travel bag for better storage when not in use, as well as easier portability when on the move. 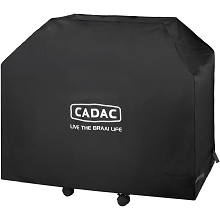 The Cadac 98700-30-CVR has your Stratos 3 Grill covered. Featuring both PVC and vinyl materials, this cover will act as a weather protective sheild for your grill year long. Specifically designed with the dimensions of the Stratos 3 Grill in mind, simply place this cover over your grill and secure it in place with the convienient velcro straps around the exterior. The dimensions of this cover are: 42”H x 49”L x 20”W. 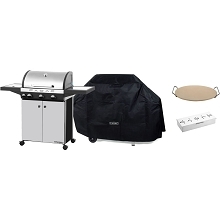 The 98700-33-01/CVR-KIT includes the Cadac Stratos 3 Stainless Steel Gas Range Grill and Grill Cover. 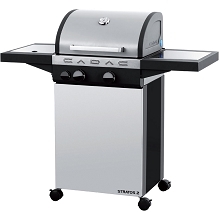 Cadac introduces the 39,000 BTU Stratos 3 Steel Range Grill, a stylish and high-performance unit loaded with features and ample cooking space. This model operates off of three high grade stainless burners as well as an aluminum die-cast side burner, both triggered by automatic piezo ignitions. The main cooking area covers 390 sq. inches and includes formed porcelain enamel cooking grids that fit into place. The 11-inch side burner is built-into one of the collapsible wings on the side of the grill. This model’s dome lid is double-lined with stainless steel for better heat retention and a high-quality thermometer is built-in for your convenience. The grill rests on a convenient stainless cart that provides plenty of storage solutions for your accessories, tools, and gas cylinder. Extend the life and maintain the condition of your grill with the included full-length, cover with Velcro closures. Made from heavy-duty, waterproof, UV-resistant vinyl, this grill cover will help protect your grill from the elements. 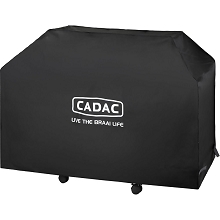 The Cadac 98700-20-CVR has your Stratos 2 Grill covered. Featuring both PVC and vinyl materials, this cover will act as a weather protective sheild for your grill year long. Specifically designed with the dimensions of the Stratos 2 Grill in mind, simply place this cover over your grill and secure it in place with the convienient velcro straps around the exterior. The dimensions of this cover are: 42”H x 44”L x 20”W. The Cadac 98700-51 is a reversible grill plate that adds more convenient options for cooking on your Stratos Range Grill. Made of hard aluminum and protected with an non-stick anodized coating, this is a great accessory to have when grilling eggs, bacon,small vegetables, and more. 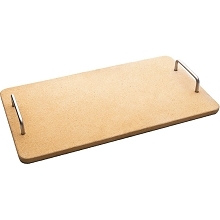 One side of this accessory is a smooth, flat surface to cook your items on. 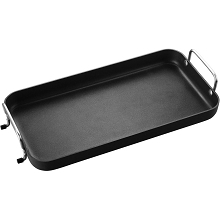 If you want to finish off your products with some charred marks, simply flip the pan over and use the ribbed griddle surface. When you have finished cooking your items and the plate has cooled down, simply rinse any excess food and grease off and run it through the dishwasher. Add this grill accessory to your outdoor cooking collection and enjoy the two additional cooking surfaces all in one convenient unit. The 98700-33-4PC KIT includes the Cadac Stratos 3 stainless steel gas range grill, grill cover, smoker box and 13-inch pizza stone. Cadac's 39,000 BTU Stratos 3 grill is a stylish and high-performance unit loaded with features and ample cooking space. This model operates off of three high grade stainless burners as well as an aluminum die-cast side burner, both triggered by automatic piezo ignitions. The main cooking area covers 390 sq. inches and includes formed porcelain enamel cooking grids that fit into place. 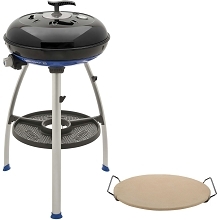 The 11-inch side burner is built-into one of the collapsible wings on the side of the grill. This model’s dome lid is double-lined with stainless steel for better heat retention and a high-quality thermometer is built-in for your convenience. The grill rests on a convenient stainless cart that provides plenty of storage solutions for your accessories, tools, and gas cylinder. Extend the life and maintain the condition of your grill with the included full-length, cover with Velcro closures. 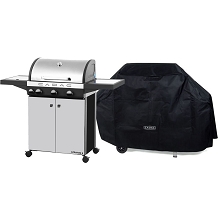 Made from heavy-duty, waterproof, UV-resistant vinyl, this grill cover will help protect your grill from the elements. Add a smoky flavor to your food with the included stainless steel smoker box. Compact and ready to go, enjoy the flavorful bark that forms on your favorite proteins. It’s made of thick gauge stainless steel that is durable and easy to clean. Small enough to travel with, this smoker is perfect for the chef on the go. With Cadac’s 13-inch pizza stone, enjoy cooking pizzas on your grill or oven without the mess. This durable stone will cook your pizza evenly and prevents char marks that are typically left behind from a grill top. The porous nature of the stone also helps absorb moisture and results in a perfectly crisp crust. 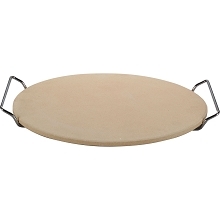 Since the pizza stone distributes heat evenly, you will never have to worry about rotating your food. In addition to pizzas, you can also use it to cook quesadillas, crispy cookies, and pastries.